In today’s manufacturing landscape, more processes are automated. This saves time and human capital expense . . . until the automation breaks down. The design of integrated electronics means it’s more difficult for untrained personnel to fix them. In many cases, the cost and downtime involved in replacing or “retrofitting” systems are not allowable. This is where a quality repair facility with factory trained technicians can be your ally. When researching industrial electronic repair facilities there are a few questions you want to ask. Is the repair facility familiar with your industry? Make sure you ask questions before you choose a repair facility. Do they understand the environment and unique operating parameters of your equipment? If your equipment is offshore, do they understand how salt water corrosion can affect electrical components? These are questions you need to ask when choosing a facility to repair your expensive automation equipment. There are many facilities that claim to repair automation equipment but are geared more towards commercial electronics like televisions and computers and non-NEMA rated equipment. Make sure the repair facility you choose meets your standards and the standards of your equipment. Are the techs trained to repair your item? Next, make sure that facility has trained technicians. 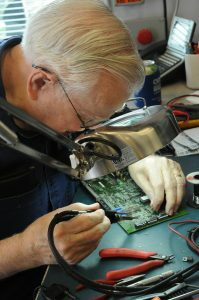 Becoming an electronics repair technician is not as easy as you think. It requires years of study, an understanding of current flow and circuit design and a lot of experience. Ask about the training in the facility you chose. Are they familiar with your industry? You are not paying them for what they know, but for what you don’t know. What is the warranty rate? Finally, what is the warranty rate of the facility and how many units per month do they repair? It is easy to have a 100% warranty rate if you only fix 1 item a month. And what kind of warranty do they offer? Is it 12 months, 18 months and what exactly does it cover. Some warranties state they only cover the exact components repaired while others do what is known as a full refurbishment and cover the entire device. Also, what kind of testing do they do on the device after the repair is complete? Do they load test the equipment they repair and do they simulate the environment the equipment is used in to test it? These are important questions to ask to ensure your equipment is repaired properly. The bottom line in any repair situation is you want to save money and time. If it is a spare you want it to work when it is pulled for service. You want to know that attention to detail and quality where at the forefront of the repair experience. By asking these questions and by doing some research you can find a trustworthy and dependable partner to keep your operations running.